The book follows the experiences of recent Stanford University humanities graduates — admittedly, a very elite group of graduates, says Stross — all of whom are now thriving in the high-tech hotbed of Silicon Valley. We recently chatted with Dr. Stross about his mission to help more companies see the value of hiring for the skills liberal arts majors excel in; here are edited excerpts from that conversation. Dr. Randall Stross: I wanted to give employers examples of students who had found work in positions that had no apparent connection to their major, and who had gone on to do very well. I’m hoping their examples will show that the content of a major is not a limitation, that it’s general analytic and communication skills that are most important. If a student has a deep interest in a major and works hard, then he or she will acquire skills that are quite useful in the workplace. I’m speaking not as a humanities professor who hopes this is true but as a business school professor who has interviewed a number of recent graduates and has followed the progression of their careers. Q: What do you hope will be the impact of your message? Stross: I’m trying to prod more employers to expand the range of majors that they will consider in filling entry-level positions. I didn’t want to take the “you should do it because it’s the right thing to do” position. I wanted to show cases of students who majored in English and classics, philosophy and film criticism and went on to learn entirely new fields. That’s what college students do: They learn things they’ve never known before quickly. And it’s that learning how to learn that is the most valuable thing college students should be leaving with. For their part, employers need to let go of the notion that a newly minted graduate is ready to handle any position on day one. Employers wanting students with very narrow training is, historically speaking, a new attitude. There used to be an understanding that employers would need to make an investment to train new graduates. One can argue that employers should highly value students who, in the face of all the pressure to major in business, science or engineering, still persist in majoring in a subject they love. They’re demonstrating a passion for learning that’s an asset in the workplace. Q: In such a competitive, STEM-focused job marketplace, what’s the good news for liberal arts majors? Stross: Liberal arts majors have a skill set that allows them to gain promotions and expand the range of their responsibilities. Those skills include being able to analyze a large body of data and draw useful conclusions; being able to communicate insights; and being able to take ideas from one domain into another, such as the technical side to the non-technical side. Liberal arts graduates often fill the role of liaison between engineering and marketing because they develop the capacity to use different capabilities for different audiences. Q: What career advice would you have for CSU students, whatever their major? Stross: I would encourage students who are in applied fields such as business, engineering and nursing to take all the liberal arts classes they can. Sometimes students view these classes as onerous [general education] requirements, but they are great opportunities to expand one’s intellectual horizons. For liberal arts students, we’re seeing a lot of interest in a business minor. That allows, say, a classics major to demonstrate that he or she has a practical side. And no one would be ill-advised to take some programming classes. Programming and coding is the new literacy. 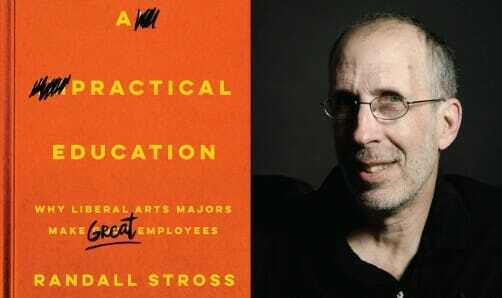 Learn more about Dr. Randall Stross and his book, “A Practical Education: Why Liberal Arts Majors Make Great Employees” (Redwood Press/Stanford University Press).